Asus will showcase the XG Station, an audio-visual workstation for laptops, at the upcoming Consumer Electronics Show (CES) 2007 in Las Vegas. Aimed to give users better graphics and audio-visual effects when connected to their notebook, it is equipped with discrete graphics chips, Dolby output and USB 2.0, according to the company. Asus XG Station is the worldâ€™s first docking station to provide a standard PCI Express slot for additional graphics. It connects to a laptop via Express Card slot. Asus said the device accommodates future graphics technology such as, HDCP and HDMI upgrades possibility. 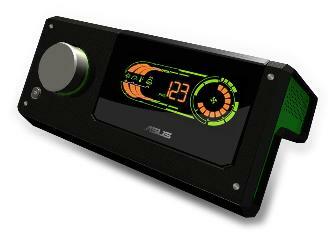 XG Station also features enhanced audio and video functions. With Dolby Headphone technology any headphone is capable to delivers cinematic 5.1-channel surround sound for a dynamic true-to-life quality during PC game play and music or video playback. Real-time Overclocking is easily controlled with the ergonomic knob design for simple GPU clock speed adjustments. The XG Station’s LED screen provides display of critical system status statistics such as system master volume, GPU clock speed and GPU temperature, Dolby Headphone feature status, current actual Frames Per Second (FPS) information and GPU fan speed indicator. During CES, Asustek will also display the W5Fe laptop, featuring Vista SideShow, as same as the G1 and G2 gaming notebooks.